I highlighted these lines in my copy of Goldberg’s wise and funny book years ago. But I feel like I’m just beginning to truly understand their implication in terms of what is possible for me as a writer. Why did it take me so long to come to this understanding? Maybe I’m a slow learner. More likely is the fact that I’ve been writing a lot this summer. And through the process of becoming more immersed in the story I’m working on, I have become fearless. Okay, less fearful. But there’s more to it than just writing more. Two experiences from the past month have played a huge role in helping me get to this point. Thanks to a conversation Melanie Meehan and Betsy Hubbard had on Twitter a few months ago, I am now part of an online critique group. I cannot overstate how lucky I am to work with Melanie, Stacey, and Julie. They are incredibly supportive and kind, but also offer meaningful suggestions and advice. Another benefit of being part of this group is reading my partners’ amazing writing. Melanie, Stacey, and Julie are all talented writers, and I’ve already learned so much from the pieces they’ve shared with the group. My experience at art camp earlier this month also helped me be more comfortable to “play around” and “take chances” in my writing. One of the activities that I found especially helpful was creating an “analog drawing” of a problem. In analog drawing, only lines are used to express emotion, among other things. As I sketched my problem, I realized I was creating a narrow doorway with a border that looked very much like battlements. “Is this how I approach problems?” I wondered, appalled at the thought. I began to sketch other doorways, doorways that opened wider and were less rigid. As I continued to draw, I came to the realization that these narrow doorways were impacting my writing. As my husband might say, “Well, no s*&t, Sherlock.” As soon as I read this line, I knew my critique partners would point out its many weaknesses immediately. I really didn’t want them to even see this lame line. I also thought of my drawing of the opening doors. Why was I afraid to find out how Holly dealt with this devastation? Just write. Dive in and see where this line leads. In her book The Artist’s Way, Julia Cameron writes that we are “creating pathways [into our] consciousness through which the creative forces can operate.” I realize now that I had to write the first line in order to create the pathway to get to the second line. Uncovering deeper understandings about these characters and their story isn’t always possible without a surface level understanding of who they are. Put another way, just as artists have to sketch the outline of a subject before they can add layers of color that create nuance and depth in their drawing or painting, writers have to start with a general idea of what their writing is about before they can add the nuance and depth that creates memorable characters. While I’m happy about the writing I’ve done over the past month, I’m unsettled by the implications of how I arrived at these insights for teaching. Having the luxury of filling my days with reading, writing, drawing, and thinking about what interests me, at my pace, is not an opportunity we give our students very often, if ever. Children need the time to play and explore, to discover what is possible, not just in writing, but in all areas of their lives. They also need the kind of supportive and nurturing environment my critique group has given me. Finding a way to provide these conditions is critical for anyone, young or old, to create the pathways into their consciousness that will awaken them to all the possibilities within themselves. When I was a kid, my family always spent a week camping in Rhode Island. We spent many days at the beach, but we also spent time at Beavertail State Park in Jamestown. My parents loved to sit and watch the waves crashing over the rocks and the ships in the bay. My favorite part of being at Beavertail was examining the many tide pools that dotted the rocks when the tide was out. I imagined that I was a marine biologist, studying the seaweed and mollusks that braved the harsh conditions of these rocky oases. I was reminded of these tide pools last week when a friend and I visited the Yale Center for British Art to see “‘Of Green Leaf, Bird, and Flower’: Artists’ Books and the Natural World,” an exhibit which celebrates the work of “self-taught naturalists and artists [who] recorded and observed the natural world around them from the sixteenth century to the present.” The variety of artistic responses and creativity on display was stunning. In addition to traditional sketches and watercolors, there were collages, works of cut paper, dioramas, and mixed media. I found this collage of sea weed specimens especially charming. 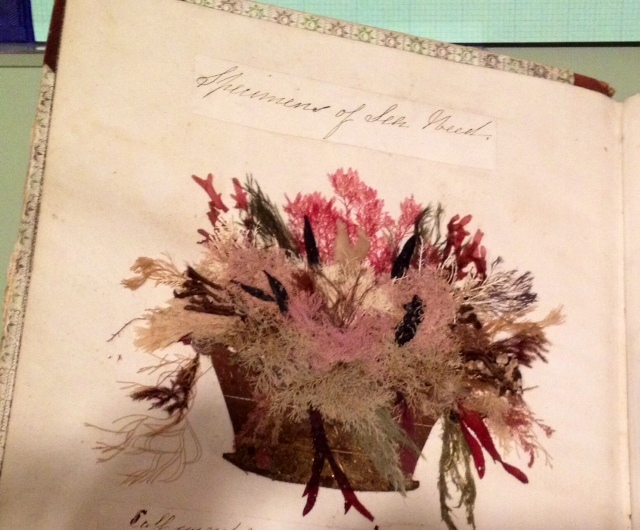 Apparently creating this kind of sea weed collage was a popular activity in the 19th century, and E.L. Aveline’s poem, “Flowers of the Ocean, often accompanies such pieces. The poem appeared in The Mother’s Fables, in Verse, Designed, Through the Medium of Amusement, to Convey to the Minds of Children Some Useful Precepts of Virtute and Benevolence in 1812. The title page of this volume urges readers to “Find tongues in trees, books in running brooks/Sermons in stones, and good in every thing.” Not bad advice, and the artwork in this exhibit demonstrates that many people followed it faithfully. Then call us not weeds—we are Ocean’s gay flowers. Are nursed by the ocean, and rocked by its storms. “Of Green Leaf, Bird, and Flower” is on display until August 10. If you’re near New Haven, it’s worth the trip. 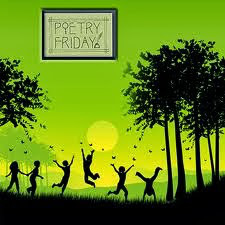 Please be sure to visit Janet and Sylvia at Poetry for Children for the Poetry Friday Roundup. A formula, a phrase remains, –but the best is lost. 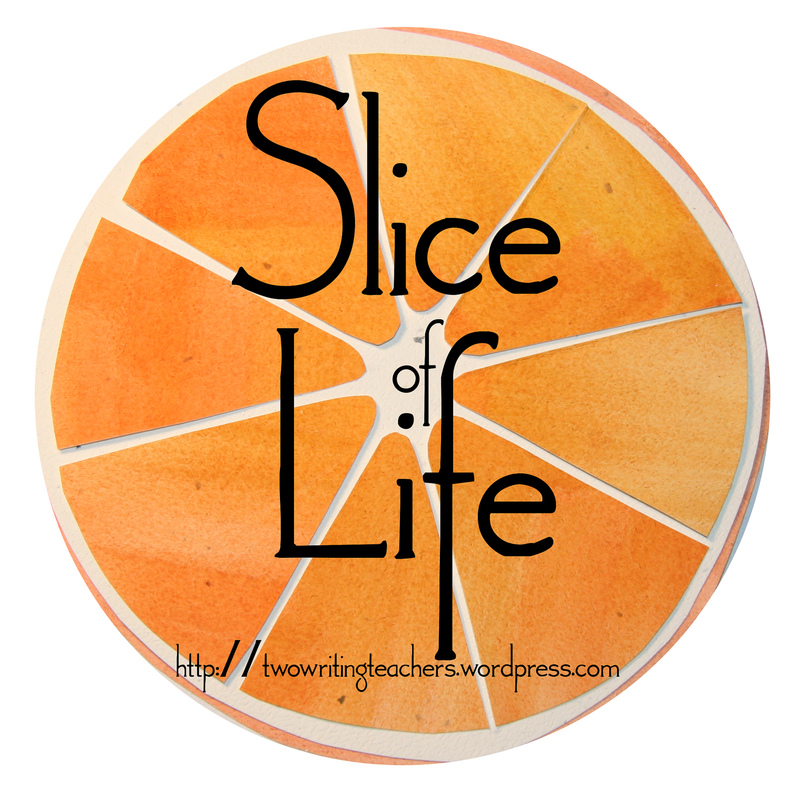 Please be sure to visit Linda at Write Time for the Poetry Friday Round Up. I am not an artist. But over the past year or so, drawing has been nudging its way into my brain. At NCTE, Linda Rief spoke about incorporating several different art techniques into a poetry project. Linda’s presentation inspired Vicki Vinton to invite readers of her blog, To Make A Prairie, to do “something creative” in response to a poem they love. So when I was offered the opportunity to attend an art “camp” for adults, I jumped at the chance. For the past two days, I have been sketching and painting and making collages. This experience has been everything I hoped it would be and more. One of yesterday’s activities found us out in the garden, gathering images. It was a classic summer day: bright blue sky, puffy white clouds, insects buzzing from flower to flower, birds chirping from the tree tops. It was lovely just to sit and soak in the beauty of the moment. Our teacher instructed us to do just that, but to write and/or sketch the images surrounding us. Back in the studio, we were given time to turn our thoughts into haiku, then time to capture the image in watercolor or colored pencil. First try–tiger lilies are hard to draw! Some of my most productive thinking is done while I’m walking my dog, Lucy. She was up to her usual tricks as we walked along this morning, taking her time to sniff what seemed like every inch of our route. Her pokiness made me think of this post from very early in my blogging life. So I decided to repost it for Throwback Thursday. Hope you make time to let your mind meander today! Last week, I spent two days working with middle school teachers on curriculum revisions. We got a lot accomplished and had some very productive discussions. But on Monday, one teacher commented about how sorry she was that she couldn’t do any creative writing anymore. This surprised me, because in my mind, creative writing and narrative writing go hand-in-hand. When I asked her why she felt this way, she had difficulty explaining. “It’s just not the same. We just don’t have time.” She went on to explain a project that she had done in the past, but skipped this year. In previous years, she had displayed an assortment of pictures she’d gathered from magazines. Each kid chose one that intrigued him or her, then wrote a story to go along with the picture. The finished story was shared with the class, and the students had to guess which photo inspired the story. This really upset me. This is exactly the kind of writing kids should be doing more of, not less! So the next morning, I rounded up a collection of post cards from art museums and clippings from magazines and newspapers. These were laid out on the table when the teachers arrived. The teacher laughed when she saw them because she knew exactly what I was thinking. Everyone chose a picture and wrote for ten minutes, telling the story they imagined their picture contained. We each got right to work and stayed completely engaged with our writing the entire time. In fact, I think everyone could have kept writing. We shared, complimenting specific writing moves others had tried. The variety of techniques was impressive, considering the size of our small group. After this, I read the CCSS narrative writing standards for grade 8. Our work touched on them all except “Provide a conclusion that follows from and reflects on the narrated experiences or events,” and that was because we had only worked for a short time. I pointed out that we now had writing that could also be used to address the language and vocabulary standards. My colleague still didn’t seem convinced. “This will take too long,” she said. “This only took about 15 minutes,” I said. “Why don’t you start class with this? You know, do it as a warm up,” another teacher suggested. “They don’t have to finish it, it doesn’t have to become a polished piece,” added a third teacher. Those were the words she needed to hear. The words that helped her realize that any writing time is better than no writing time. 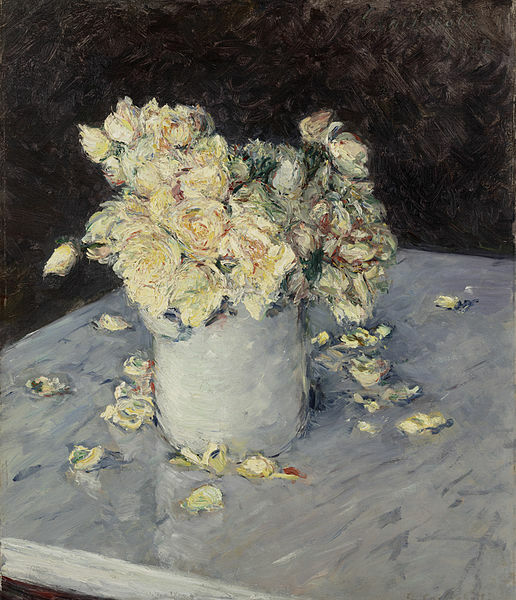 Her students could return to these pieces if they choose to, or not. I shared these words with my colleagues when we finished our writing. Everyone agreed that their imagination had been sparked in some unexpected way, and that this was an activity they would turn to again and again. The possibilities are endless. This is the painting I chose to write about. 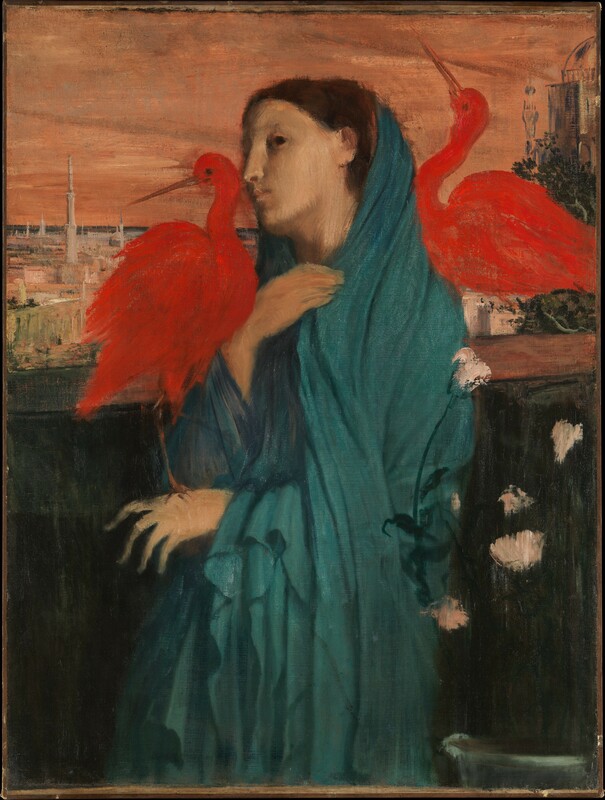 I want to know why this woman looks so wistful, and I want to know more about the birds by her side. Whatever the answers turn out to be, I know my life will be richer because I opened myself to these questions.